On Saturday, June 4, 4-6PM, Irvine Contemporary will host a closing day exhibition reception with artist [dNASAb] and electronic musician Yoko K, who will perform in dialog with the multidimensional sculptures of [dNASAb]. Reception 4-6 PM, performance 5 PM. [dNASAb] has a BFA in Sculpture and Mixed Media from Florida State University, and was awarded an International Summer Residency at the Experimental Television Center, Owego, NY (2006), where he worked with the “Wobulator,” Nam Jun Paik’s pioneering video synthesizer. In 2010, [dNASAb] was awarded a scholarship at Harvestworks Digital Media Arts Center, New York, and an Artist’s Residency at the Institute for Electronic Arts, Alfred University, New York. He was recently an Artist Honoree at the BRIC Contemporary Art Gala, 2010, “Brooklyn Art:Work”. [dNASAb] has exhibited widely in the past ten years, including exhibitions in New York, Moscow, Basel, Switzerland, Seoul, South Korea, and Paris. He produced a solo installation of new works at Volta, New York (March, 2011), and a solo exhibition in New York with Frederieke Taylor Gallery (2010). He is featured on the MoMA-P.S.1 “Studio Visit” site. He presented a video of his work in the “Contemporary Art + Social Media Art Salon,” Art Basel-Miami Beach (2009) [view video]. [dNASAb] will have a solo exhibition at the Museum of the Moving Image, NY, next year. Four of his works were acquired by Microsoft for their permanent art collection. The artist lives and works in Brooklyn, NY. 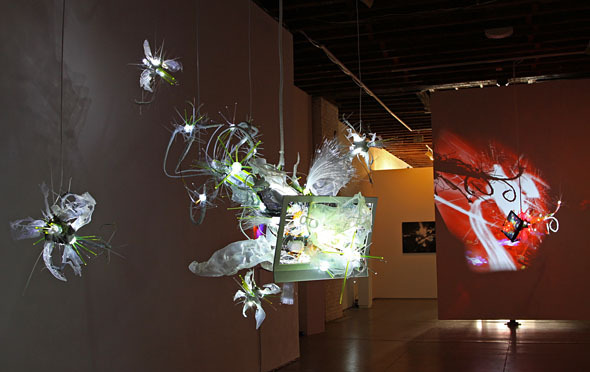 [dNASAb], installation view of Dataclysmic 4 and Dataclysmic 3, 2011. LED screen, Digital Media Player, LEDs, steel, silicon, plastic, fiber optics, 720P HD video, projection. Dimensions variable. For further information, contact Lauren Gentile, Director, 202-332-8767 orlauren@irvinecontemporary.com.